Yorkshire Terrier December 1, 2018 April 12, 2019 No Comments on Which is More Suitable for Yorkies – Harness or Collar? The appearance of the dog is very important. The hairstyle and harness or collar play a significant role in the dog’s look. There are many owners who want to make their dogs stylish and fashionable, they use the harness for this purpose. It not only makes the puppy fashionable but also useful to make your dog healthy. If you want to know about the most appropriate option for your Yorkie then it is necessary to understand the anatomy of the dog. What is the effect of harness or collar on the canine neck anatomy of the Yorkie? There are two parts of the throat of the Yorkshire Terrier that are trachea and esophagus located in the region near to the vocal cords. The trachea of the dog is not protected by the bone but there are cartilage rings which are not tough like bones, so it is necessary not to pressurize the trachea with the collar. How is the harness better from collar? 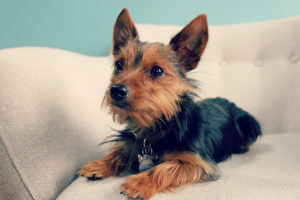 If you use a collar for your dog then it pressurizes the trachea which is not secure for the little Yorkie but healthy dogs are able to bear the pressure. The Yorkies who wear the collar for a long time, a little pressure on the neck might cause serious injury. It will also cause trouble to little Yorkies in eating and exercise. The treatment of neck trauma is very tiresome and long term. While the harness is a quite delicate and better choice for your dog as it properly fit around the shoulder, upper back and chest. So, the pressure created by harness can be easily tolerated by bones and muscles and Yorkie can run and walk for a long time period without any trouble.